Fans know Jack Griffo from his Nickelodeon hit show The Thundermans, but his newest role is completely different. To be honest, it's inspiring – if you will. Jack stars as Sebastian in the movie Apple of My Eye. Sebastian is a boy that has been blind since birth who befriends a girl named Bailey after an accident that leaves her without her eye sight. Obviously, this is nothing like what he's done on Nickelodeon. So, how did Jack prepare for this? 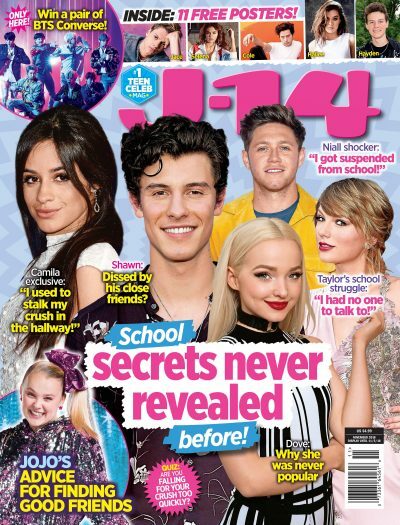 J-14 chatted EXCLUSIVELY with him about how he got ready to film, what he learned about himself by playing this character and what he hopes his longtime fans will feel when they see him in this new light! As for prepping to play someone who is blind, Jack said he did, "A lot of research. It was the first role that I really prepared for so in a way. I did a lot of research online about blind people and people that live part of their life with vision and then go blind and people who have never seen anything before, like my character. So I did a lot of research. My roommates blind folded me and I started trying to get around using that and then my director sent me a walking stick so I started to learn how to use that. So, that was interesting trying to figure out how to work that and do it right and do it properly. And then the last thing I did before I went to Florida is that I went to CVS and I got some cheap, cheap sunglasses. Then I bought some spray paint and I just blacked out the shades so I wouldn’t look like a ridiculous person walking around with a blind fold." Not only did Jack do a lot of physical preparation but he also learned something mentally about himself in the process of all this. He said, "I definitely learned about who I was. When you get really into something like this, like I said into your character and the style of acting that it is…I learned how important it is to everyday kind of count your blessings because you never know when one is going to fall off the list. We’re really, really blessed. Everyone here in America is really, really blessed and I think people forget that a lot." Words of freaking wisdom from this Nickelodeon star. Of course, this all seems quite different from what his longtime fans have seen him do in the past. But, it's important to note that Jack is the same Jack, he's just in a different role. He revealed that he hopes his fans will love this movie just as much as they love The Thundermans because there's no doubt that this experience was something he'll never forget. He said, "You know I hope that fans see a different side of me and I put myself in a different position than I am in Thundermans that I hope is perceived well. That’s all I can think really, that’s all I can hope for. It teaches people. It teaches kids about taking things for granted. I think for kids especially, the film will make them appreciate everything. Seeing Bailey, our main character, go through this hard time maybe will tell kids, maybe you don’t have it so bad. It will really make you appreciate what you have. So that’s what I hope for is perception." This is a flick that will make you laugh, cry and get inspired about your own life. Oh yeah, and catch Jack in one of his most dramatic roles yet but still keeping a layer of humor to him that fans have come to know and love! Make sure to watch Apple Of My Eye on DVD today! What do you think of Jack's new role? Let us know in the comments below!